I made this for Shania to take to school for “Pi Day.” My goal was to find a pie that would be appealing to kids and that Shania could transport easily and not worry about refridgerating. So it came down to this or fudge pie and she, of course, chose chocolate chip! 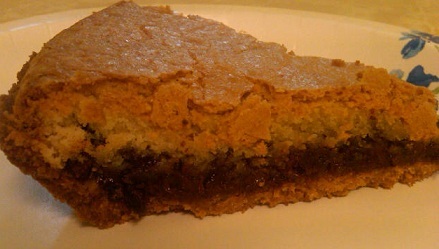 Very simple recipe and what kid wouldn’t love a pie inspired by chocolate chip cookies? I altered the recipe just slightly by using less butter and adding vanilla extract. 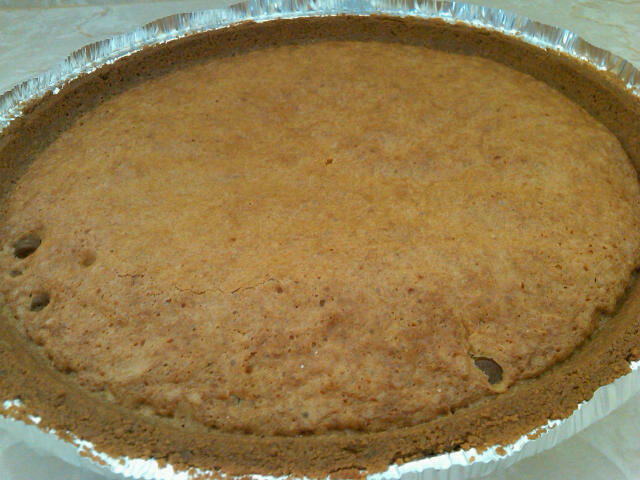 I used a pre-made graham cracker crust. When I make this again for the family I plan to serve it with whipped cream. In a large bowl, beat the eggs until foamy. Add the flour, white sugar and brown sugar; beat until well blended. Blend in the melted butter and vanilla extract. Stir in the chocolate chips. Pour batter into a 9 inch pie crust.